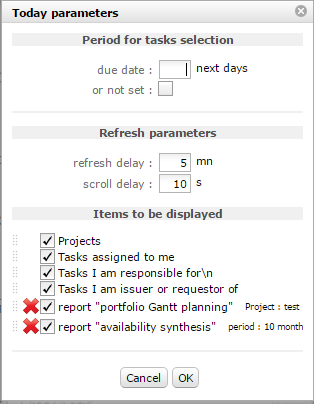 This screen allows user to have a global view of its projects and tasks. This parameter defines the screen that will be displayed first on each connection. By default, this screen is selected. Messages are displayed depends on some criteria. Every message is component by title and message . Messages are defined in Messages screen. Allows to refresh data according defined delay. Also the screen will be scrolling from top to bottom according defined delay. Click on to enable/disable automatic refresh. Click on to print Today screen. Click on to access screen parameters. 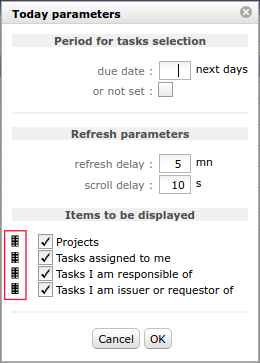 Allows to define the period for tasks will be displayed. Select only items with due date less than today plus this selected period. Select also items with due date not set. Allows to define parameters for automatic refresh. Selects the delay between two screen refresh. Selects the delay between two scrolling. Allows to define sections displayed on the screen. Allows to reorder sections displayed with drag & drop feature. Using the selector area button icon drag . Start page for new installations to assist the administrator in the first configuration steps. A progress display allows to determine the percent of complete installation. You can hide this section on startup, just unchecked. This section will not be displayed anymore. To show it again, select it as the start page in Users parameters screen. A quick overview of projects status. The projects list is limited to the project visibility scope of the connected user. To do: Projects to do. Not closed : Projects to do and done. All : Projects to do, done and closed. Click on the name of a project will directly move to it. Manuel indicator can be set on project. Trend and health status indicators are displayed. This icon allows to display the trend of the project. This icon allows to display the health status of the project. Calculated progress and overall progress are displayed. Actual progress of the work of project. On each project shows part of “to do” (red) compared to “done and closed” (green). Additional progress manually selected for the project. Left: Left work for the project. End date: Planified end date of the project. Late: Number of late days in project. Numbers of elements concerned to a project are displayed. On each element shows part of “to do” (red) compared to “done and closed” (green). Here are listed, as a “To do list” all the items for which the connected user is either “assigned to”, “responsible of” or “issuer or requestor of”. Click on an item will directly move to it. Number of items listed here are limited to a value defined in Global parameters. id Unique Id for the item. Project The project concerned by the item. Name Name of the item. Due date Planned end date or due date. Status Actual status of the item. Issuer Flag on indicate the user is the issuer for the item. Resp. Flag on indicate the user is the responsible for the item. Id column displayed unique Id and specific icon for the item. You can select any report to be displayed on the Today screen. To do this, just go to the selected report, select parameters and display result (to check it is what you wish on today screen). Click on to insert this report with parameter on the Today screen. Any unchanged parameter will be set as default value. These reports will be displayed on Today screen like other pre-defined parts. You can reorder like any other parts. Click on to completely remove them from the list.